Home » Crypto Trader Guides » What Are Masternodes? What Differs Them From Mining? Masternodes are full nodes that allow their operators to perform advanced functions that are crucial for running a blockchain. Masternodes are different from crypto mining, although they have a connection with it, as node operators receive rewards from every “solved” block. According to CoinGecko’s Q3 2018 Cryptocurrency Report, there was an increase in interest in masternodes space, which was probably due to a bearish market that knocked crypto prices down. Newcomers to the crypto world often have trouble understanding all different crypto-related terms and other aspects of this vast space. Some of the more common questions, apart from which coins to invest in, include asking about such things as masternodes. The term “masternode” is often casually mentioned in crypto-related discussions, without anyone bothering to explain it properly. This is what we will cover today, with the addition of Coingecko’s recent report on masternodes in Q3 2018. Let’s start simple, by first answering the question — what are masternodes? Simply put, masternodes are servers that can be found on decentralized networks. It has unique functions that make it different from ordinary nodes since ordinary nodes typically cannot complete such functions. They include numerous features, including things like instant transactions, private transactions, and direct send. Each network has its masternodes, with unique features, and their pros and cons. That way, no two masternodes are alike, and every system approaches them differently. However, while masternodes can be quite rewarding, and are closely connected to crypto mining, they are also an entirely different thing, and a lot of newcomers mistakenly confuse the two. Since masternodes can do much more than regular nodes, running them also involves a more significant investment. However, those who run masternodes are also very motivated, as they are rewarded for doing so via a portion of block rewards. Depending on the network, masternodes operators may be rewarded once per day, or even several times per day. However, it is essential to understand that masternodes are not mining. A lot of people also mistakenly assume that masternodes are an extension of PoS, where cryptos are not mined but staked. However, this is also not true, as PoW project can use masternodes as well. Running a masternode allows operators to generate a passive income by simply holding on to their coins, which is a method similar to how stakes work in PoS. It is different from mining as earning money doesn’t require obtaining expensive crypto-mining gear. The money earned by running a masternode depends on various factors, which means that there is no simple answer. Each project works differently, each masternode is unique, but one thing that remains true is that running a masternode can be very profitable if you select the right coin, and its value surges in time. Recently, CoinGecko has released its 5th report on cryptocurrency and its most notable aspects, with the first one being in Q3 2017. These reports usually provide investors, developers, and crypto enthusiasts alike with a lot of insight, which is what makes them very valuable. When it comes to masternodes, CoinGecko announced a growing interest in the space, which was initially noticed by their partner, Masternodes.Online. The report claims that the number of masternodes has been growing rapidly, likely due to the bearish market. Since investors were prevented from making a profit via trading, they turned to alternative methods, such as running a masternode. 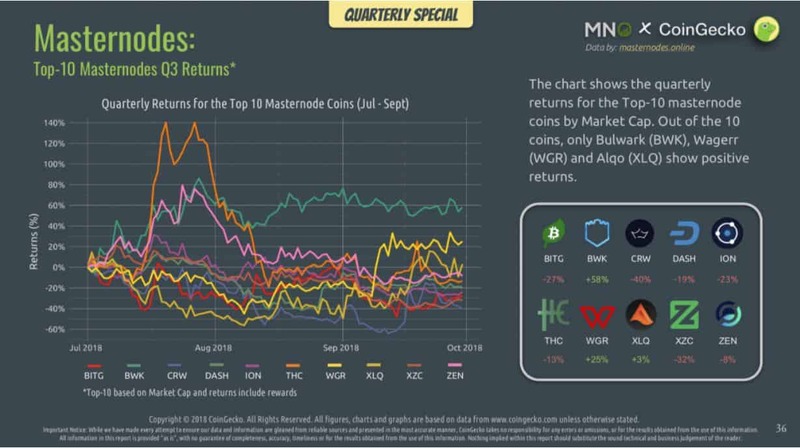 Even so, the report claims that among the top 10 masternodes in terms of market-cap, only three have seen a positive return in the third quarter of this year — Bulwark (BWK) with +52%, Wagerr (WGR) with +25%, and Alqo (XLQ) with only +3%.